I have been asked a few questions recently about editing panoramas in Photoshop so I thought I would post a short video showing the process for the iGuide camera system. The video shows me removing an object using content aware fill. It's probably the easiest way to remove unwanted reflections of myself, the camera, and objects from a tour. What tools do you use to remove unwanted objects from your images? Great tutorial. It seems like there'd be a big market for tweaking panos, cleaning mirrors and removing the tripod's nadir and other objects. Maybe you have thoughts on the financial feasibility of removing ALL 3D objects from a room. In other words, digitally "unfurnish" a house. Unlike a painting, a couch in the middle of the room is a bit trickier to make vanish -- especially if the couch sits on a patterned rug or carpet. On a lark last week I went ahead and tried to REMOVE furniture from a 2D room photograph. The results were surprisingly "not bad" for a first pass but it took a while to do it. Content Aware and a whole lot of cloning make it feasible. If we could empty a house, people could then stage it with virtual furniture and accessories. Re tools. I like Photoshop but someone once mentioned a Resynthesizer GIMP plugin that works like Photoshop's Content Aware tool. I tried it in GIMP and surprisingly it works pretty well although it's not as easy to use as Photoshop's. Supposedly there's also a Gimp Content Aware Scaling plugin out there too. This is pretty neat. Can you edit the entire panorama in one? @Baxter, Chris_iGuide's video says he used Photoshop to edit a pano. You can edit a pano in any image editor. I made a quick demo showing this working on live panos. Below we have screenshots taken from two panos .. The top one shows stars on a wall in a room. Call that pano 1. The bottom one shows the same room. Call that pano 2. In pano 2. I used Content Aware to remove those stars from pano 2. If you visit the demo page, you will see pano 1 that has the stars. You will also see two tags similar to Mattertags. The blue tag labeled "i" is just an informational tag that shows information when you move your mouse over it. The white tag with the "up" arrow is a navigational tag. Ordinarily when you click a navigational tag, it shows you a new pano. That happens here too except that the second pano is identical to the first pano. So, when you click that white "up arrow", the second pano shows. Because the two panos are identical, except for the stars on the wall, the stars appear to fade away when you click the white "up arrow." You can then click it again to make the stars come back. As long as you keep clicking the white "up arrow" the stars keep appearing and disappearing. Summary - all you're doing is moving between two panos that display the same scene. The wall in one pano has stars on the wall and the other one doesn't. Note: To see this fade illusion, don't drag either pano until you've seen the fade effect. Initially the panos are are lined up perfectly to create the illusion. After you've seen it, you can drag your mouse around to move around a pano, just like you do on any virtual tour. Click here to see the demo page. I didn't compress the panos so it may take a few seconds to load. Don't click anything until you see the pano loaded. I'm not sure what that room is. 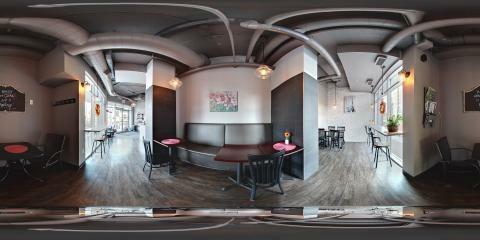 I simply downloaded the pano off of Flickr's 360 site. It looks like someone tried to put a Christmas tree into the photo. Chris_iGuide did a little touching up after he applied the Context Aware filter.I didn't have to do that this time with the star removal, but sometimes you do need to touch things up. However, as his video shows, it's not a lot of work. But, to make all a room's furniture disappear, you'd have to do manual editing in addition to Content Aware filling. For a real virtual tour, I'm not sure if this would be feasible since you'd have to remove all furniture from every pano in the tour. @Baxter Yes, you can edit the whole thing as one image if you like. However, editing the fisheye images fits better into my workflow.